: Sompo Japan Insurance Inc. Doors will open 45 minutes before the opening of performance. Available from Saturday 5 June, 2004 at 10:00am. (¥2,100 for high school students or under). The New National Theatre, Tokyo offers high school students opera appreciation classes every year in order to help them understand how wonderful opera is. 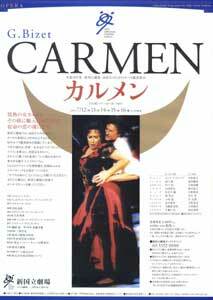 This year’s program is Carmen, the most celebrated opera in the world. Set in Spain, the opera uses exotic music full of passion to portray dramatic love and hatred between three characters: the unrestrained Carmen, the naïve José who is captivated by her to his ultimate ruin, and the splendid toreador Escamillo. The NNTT hopes that those who have never seen opera before will enjoy their first experience as part of the audience at the NNTT.